Recently our rented server has been reverting to a state where it just says pending and nobody can see it online. When I go into the Configure menu and click Update Server, it's back online and playable. All my platoon-mates think I have let the rental lapse, which is just not true - I should have another 30 days or so from my 90 day rental on Nov 28th, 2017. What's going on and is there any way to prevent this from happening? You have to keep trying. Mine was doing the same thing. Some how last night the server got changed over to 64P Operations. Is Operations offered as an option for rented servers? I thought it wasn't. just Frontlines. Regardless, it took me a number of times but I was finally able to update my server and restart it back to Conquest. They're obviously doing a lot of work to the game/browser right now. Hopefully stability will return today and we'll be pleasantly surprised with some new changes/options that are now available. i have same problem with my servers. 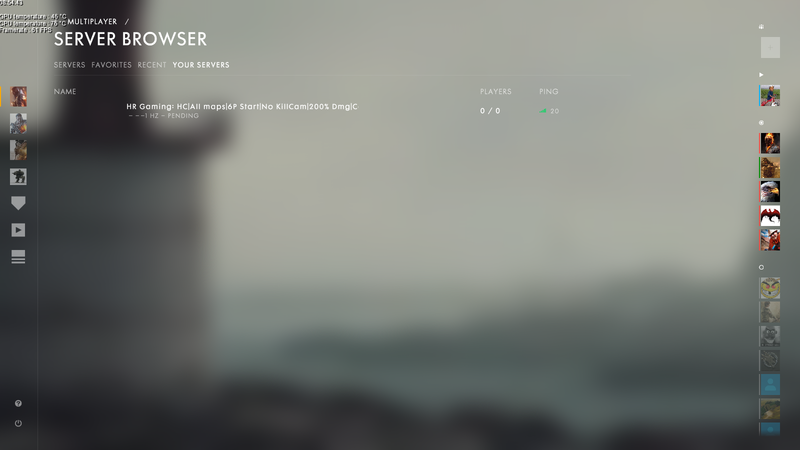 When server is empty, after few minutes status change in "pending" and nobody can see it online. Same problem for my server. yes. some inactive server pass from 60hz to 1hz and the only way to reactivate them and click on configure and update. The problem is that this can only be done by the server owner. If he is not there all the other users can not see and use the server. It's ridiculous. I understand perfectly the need to pass it at 30hz when it is empty. ok. but even 1hz and make it disappear from the browser's list is absurd and above all, this is unfair for those who paid. Keeps happening to me to. Time to do a chargeback. Iam not suprised at all.New Patch new bugs.RSP is a mess. Exactly. Talk about clueless in understanding the basics of providing good customer service. Communicate with your customers. I can sort of confirm this, but then for 1 player. I have 6 accounts / 6 pcs to fill my 2 servers - and help 4!! 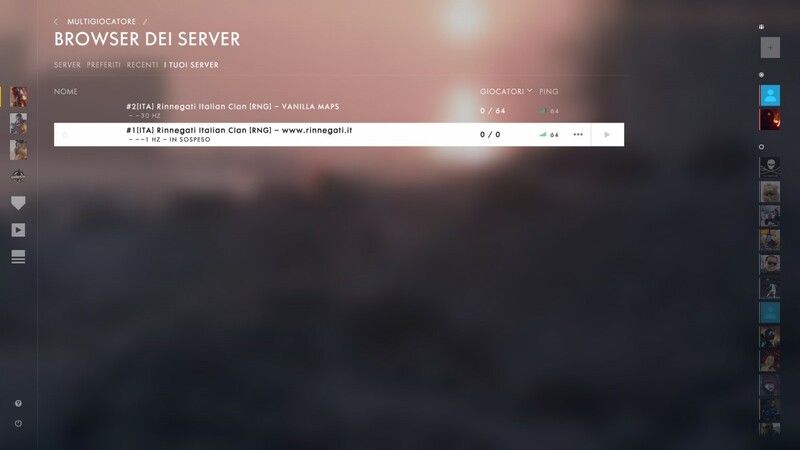 others - I first fill my pc 247 quentin server and often get help and most of the time a little earlier then me they are in, but last few days that is impossible because I have to wake up the server first buy going to server browser > your servers > update server (p.s. sometimes not enough to wake up the server, and then I put time limit on each round - just a random choice - update server, then it wakes up, then change the round limit time back to NONE and then update server again), but today I thought ... I am going to put 1 of my 6 in the server so that by the time I am awake it already has been seen by others and some regulars will come in followed by my 5. But no when I woke up my 1 was still in there it also could move, but on my 5 other pcs the server was gone. So I went to the account which is the owner of the server (my main account) - the 1 that was in there all night was account number 6 - and went to "your servers" and there it showed 0/0 and when I pressed update server it went instantly to 1/64. W T hell. Some ask if devs now know about it or not, that is INDEED a problem, we don't have a known issues tracker main topic that only can be altered by mods/devs/dice/EA. Massive has it on the ubisoft site for the division, it would stop 75% of all new posts on the forum because people first go there to find out that it is already reported. You have 6 accounts and 6 pcs... there is life outside of battlefield too you know ? He can have 20 accounts and 20 PC's if he so chooses. I don't see how this is relevant other than a pretty obvious baiting attempt.